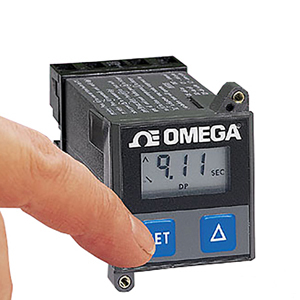 The PTC-1A timer is a low power, LCD control product designed to combine a harmonized appearance with simple-to-operate, flexible functions and high reliability. Ideal for frequent user-adjustable applications such as hot foil printing, window sealing and environmental ovens, which often require both temperature and timing control. The use of the PTC-SW momentary switch, included with the PTC-1A, allows cycle reset from a remote location for the PTC-1A. The CN1A temperature controller and PTC-1A timer are low power, LCD control products designed to combine a harmonized appearance with simple-to-operate, flexible functions and high reliability. They are ideal for frequent user-adjustable applications such as hot foil printing, window sealing and environmental ovens, which often require both temperature and timing control.